From the show called "the best of the best of radio's golden age" come these six suspenseful episodes of Johnny Dollar's far-flung private investigations, starring Bob Bailey in thirty quarter-hour episodes. 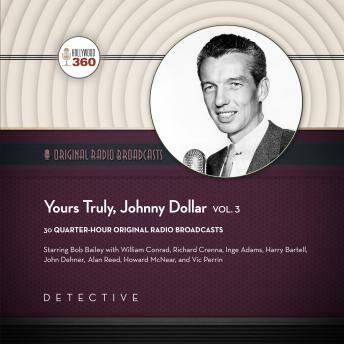 First heard on network radio in 1948, Yours Truly, Johnny Dollar chronicled the adventures of freelance insurance investigator Johnny Dollar, "the man with the action-packed expense account." For fifteen years, it was one of the most popular detective shows on the air, lasting until the final days of network radio drama in 1962. Each story started with a phone call from an insurance executive calling on Johnny Dollar to investigate an unusual claim. His investigations usually required Dollar to travel to distant locales and often involved murder. The stories were recounted in flashback, as Dollar listed each line item from his expense account: "Item one, $3.75 cab fare to the airport." Over the years, many actors portrayed Johnny Dollar, but in 1955, Bob Bailey, took over as the series was switching to a new format in fifteen-minute installments Monday throught Friday. While other radio shows were waning in the mid 1950s, Yours Truly, Johnny Dollar was at its peak.